I just couldn’t face the office. This has been a trying week, to say the least, and more of the same just wasn’t going to cut it today. My brain needed a break and my soul needed some comfort. And my house needed some cleaning. So I decided I would do my best and try to channel Donna Reed. Do you remember The Donna Reed Show? I am not old enough to have seen it on prime time, but it was a Nick at Nite favorite for me when I was in my late teens for some reason. Goth Girl loves Donna Reed. That’s priceless. 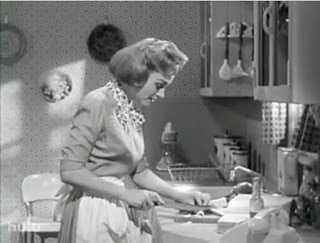 Here’s a nice shot of Donna in her kitchen, you’ll have to wait for the Goth picture of me. We’re going for the ultimate in comfort here. Chicken Pot Pie. One of the kiddie’s favorites. Here’s the stuff you need–it’s not much, see? And yes, Slow Food people, I am using a prepared pie crust. If you want to make one from scratch, be my guest. I sometimes use those Pepperidge Farms Puff Pastry Sheets, too. I took this after I had started the chicken, so there’s a little ceramic chicken to signify the chicken thighs. You can use a rotisserie chicken, or any cooked chicken. I used a package of 6 bone-in, skin-on chicken thighs, and just did a quick braise on them to get them cooked and also to flavor the broth to make the gravy for the pot pie. Heat some oil in a saucepan. Lay the chicken thighs in the pan, skin side down and season with salt and pepper. Flip it over when it’s lightly browned. Pour in 3 cups chicken broth (1 carton) and 1/2 cup of dry white wine. I put in a couple of crushed garlic cloves too–no need to peel them, you’ll strain them out later. Let it come to a boil, then turn down the heat so that it barely bubbles. Let continue to cook for about 15 minutes. Remove the chicken breasts to a plate. You can take their temperature if you like to make sure they’re cooked through. They should be about 160. If they’re a little underdone it’s ok, because they’ll cook more in the oven. Strain the cooking liquid and set aside. Return the same pan to the stovetop and heat a couple Tbsp oil and a couple Tbsp of butter. Add in 2 chopped shallots and a big clove of chopped garlic. Don’t cook them long, only enough to really smell the garlic. Burned garlic is no good. Add the diced carrot and diced celery. Season with salt and pepper. Cook for a couple of minutes, then sprinkle in 1/4 cup of flour. Stir it about and let the flour cook on the vegetables. It looks weird, but that’s how it’s supposed to look. Add the strained stock back to the pan. Bring to a boil. If you want to add diced potatoes, now’s the time to do it. This time I didn’t. Let cook down and reduce for about 10 minutes, until thickened and reduced by about a third. Add whatever other vegetables you want–I added some mushrooms and half a bag of frozen peas. I also added some chopped sage and thyme. This crappy, blurry picture shows the adding in of the chicken that was removed from the bones. Fold through and let cook 5 minutes. Pour into individual ramekins or one big pie dish or other ovenproof bakeware. Next, lay on the pastry and crimp the sides. Snip some air vents on the top. Put it on a sheet pan in case of bubbling over. Brush the top with some milk or beaten egg. Piping hot chicken pot pie! Let it cool. On to our side dish…..Roasted Acorn Squash and Sweet Potatoes with Brown Sugar. I’ve adapted a recipe from the final issue of Gourmet here. By the way, can you believe Gourmet magazine is going out of business after nearly 70 years? Conde Nast is lame. I will miss it terribly. I have subscribed to it since the late 80’s and have every issue. It is so far superior to Bon Appetit–I can’t figure out their thinking. Get your very sharpest giant knife and slice the squash lengthwise and then crosswise about 1/2″ thick. Cut the sweet potato into 1/2″ thick rounds too. Don’t peel either of them. Spread them onto a sheet pan. Drizzle with a Tbsp melted unsalted butter and 2 Tbsp olive oil. Toss and season with salt and pepper. Into the oven they go, for about 15 minutes. Pull out the rack and flip them over with tongs. Then back in the oven for 10 minutes. Now the good part. Mix 1/2 cup brown sugar, 1 tsp nutmeg and a big pinch of cayenne pepper in a bowl. Pat the sugar onto the vegetables. Kind of like the candied bacon. Look, my vegetables are smiling. Back into the oven they go for another half hour. I feel better. Now, where’s my Snuggie? Project Runway is about to come on. Preheat oven to 350-375*. I would normally use 350*, but I ended up cooking the pie and the vegetables together at 375* and it worked out just fine. Heat 3 Tbsp. oil in a saucepan and add chicken thighs, skin side down. Liberally season with salt and pepper. Cook until lightly browned then flip over. Add the wine and broth and bring to a boil. Lower the heat so that it is barely bubbling. They should be cooked in 15 minutes. Remove chicken to a plate. Strain stock into a bowl and set aside. When chicken is cool, remove the skin and shred the chicken. Return saucepan to stovetop and heat 2 Tbsp olive oil and 2 Tbsp butter. Add the shallot and garlic and cook one minute. Add carrot and celery and saute about 3 minutes. Add in the flour, stirring, and cook for 5 minutes to cook the flour. Add the stock back to the pan and bring to a boil. If you wish to add potatoes to your pot pie, add about 1 cup diced potato now. Continue to boil until reduced by about a third and the gravy is thickened. Add sliced mushrooms and peas. Fold in the shredded chicken. Pour into a big pie plate or individual ramekins. Fold the pastry on top and crimp the sides. Brush the top with milk or beaten egg to help with browning. Snip the top with kitchen shears to allow hot air to vent. Place on a sheet pan. Bake at 350 for about 30 minutes. Cool at least 10 minutes before cutting into it. Cut the acorn squash lengthwise, empty out the guts, then cut crossways into 1/2" slices. Slice the sweet potatoes into 1/2" rounds. Spread the vegetables onto a sheet pan. Drizzle with the butter and olive oil. Toss, then season with salt and pepper. Put into the oven. After about 15 minutes, flip the vegetables using tongs. Return to the oven for 10 more minutes. In a small bowl, combine the sugar, nutmeg and cayenne. Take vegetables out of the oven and pat on the sugar mixture. Return to the oven and continue to cook for 30 minutes until browned and bubbly.